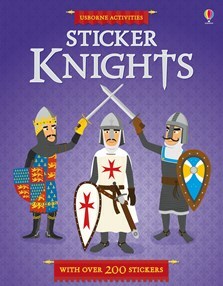 A colourful sticker book with 13 medieval scenes and over 200 stickers to dress the knights in armour or jousting gear and arm them with shields, swords and lances. Scenes include the Crusades, Arab warriors, a castle siege, knights in training and a fantastic feast. Written with the help of experts, every detail is historically accurate with fascinating facts about weapons, armour and the life of a knight in medieval times. I like this book because you can learn a lot from it. However, it was a bit gruesome in some parts!